We are grateful to the Proyecto Armando Reverón for their assistance in confirming the authenticity of this work; to be included in the forthcoming catalogue raisonné of the artist. Painted during what is known as his "White Period," 1925-1936, the Venezuelan master Reverón used a minimal palette of whites and browns to convey the ethereal effect of dematerializing capabilities of bright, tropical light. Self-exiled to the remote seaside town of Macuto, the artist's primary subjects were beach landscapes and languorous nudes arranged alone or in groups. Nora Lawrence has noted, in the catalogue for the 2007 Armando Reverón exhibition at the Museum of Modern Art in New York, that the artist's production of figurative works increased dramatically in the early 1930s and that some of the subjects for these works on paper were Caracas residents on vacation at Macuto. This was due to a combination of factors, the first being the construction of a new luxury hotel on the town's waterfront in 1928 and the second being a series of articles that brought Reverón some notoriety. Reverón and his home compound of El Castillete, became a tourist attraction where bourgeois city dwellers could view at first--hand the bohemian artist in his fantastic surroundings--with a surreptitious wink to each other acknowledging the "craziness" of artists in general. With a perhaps misguided generosity the artist graciously put up with this state of affairs for a number of years, even entertaining guests on occasion. Beginning in 1935 he isolated himself from the public in order to concentrate on a series of large canvases containing figural groups. This untitled gouache and watercolor on cardboard from 1934 was probably done for one of these vacationers, as the inscription "Sra. Wallis--El paraíso" on the back may indicate. Reverón, however, could turn even the most mundane commission into something mysterious and poetic. 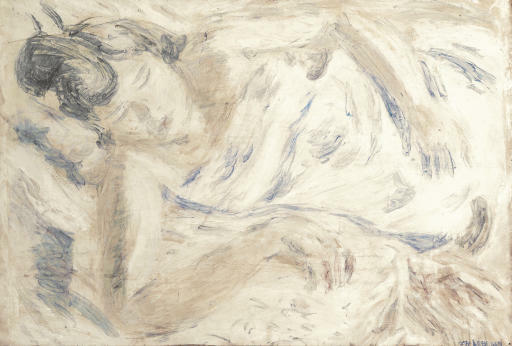 The woman is shown sleeping in a bed, which instantly creates a greater sense of intimacy and vulnerability. Lulled by the sound of the sea, bathed in sun and fresh air, the subject has surrendered herself to dream and relaxation, dropping the façade of urbane sophistication. With his characteristic quick brushstrokes, he captures the woman within a network of wavering white, brown and blue notations that serve to simultaneously demarcate and dematerialize. Whatever her origins, and regardless of her expectations, he has lightly but firmly placed her forever within his natural visual "paradise." Although we may never be able to definitively identify her, she unknowingly has submitted to being used by Reverón to express such fragile and fleeting sensual pleasures as the press of bare skin on cool sheets unexpectedly enjoyed on a summer day.